At a summer camp in Denmark several years ago, I was helping one of my Swedish friends translate an interview with Sensei. One of the questions was what Sensei thought would be a good name for a dojo. I remember this was a question asked specifically because Mats, the interviewer, was going to start his own dojo. But Sensei meant the answer to be in general, as well. His answer was “Aiki Shuren Dojo.” This was the name of the Iwama dojo. 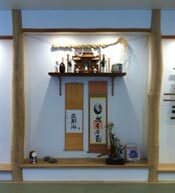 Now it´s called the Ibaraki Shibu dojo, but the name that was written on the old wooden signpost reads Aiki Shuren Dojo. Aiki Shuren Dojo is used by several dojos in different parts of the world, all of whom have been inspired by Saito Sensei. I must admit, for a while I wanted to find a brand new name for my dojo. But the more I thought about it the more sense it made to me to use the name Sensei recommended. I went to the Aiki Shuren Dojo in Iwama for the first time in 1984, when I was 26 years old, after eight years of Aikido practice. This was the beginning of my student-teacher relationship with Saito Sensei. I have been going back ever since then, for the last time in 2001. I have cleaned the toilets, fixed the shoji screens, cut the grass, done kitchen duty and so much more. The dojo has felt like home to me.